On Monday afternoon, the 25-year-old actress was spotted wearing boyfriend jeans while carrying a tray full of drinks. Despite her efforts to stay undercover by hiding her face under a large floppy hat, Vanessa Hudgens still exposed her toned mid-riff in a pair of baggy boyfriend jeans by Wildfox. She styled the jeans with a pair of brown leather open toe wedges, a brown leather belt, and a loose crop top. The actress and singer accessorized with a statement necklace by Vanessa Mooney and carried a Caterina purse by Cuore & Pelle. 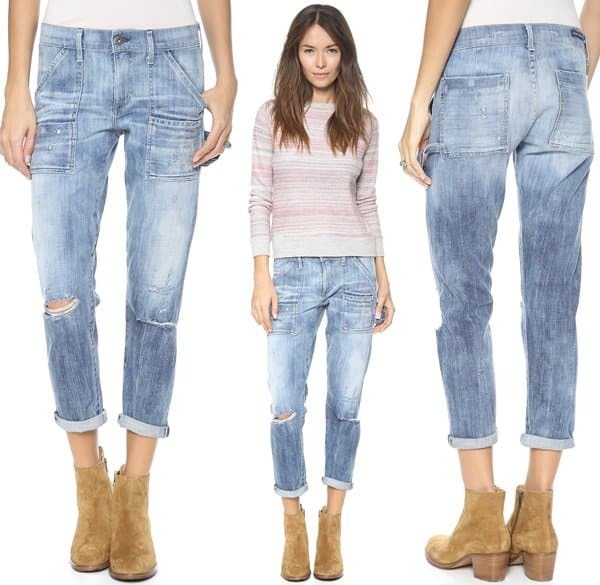 Fading and whiskering add a worn look to slouchy Rag & Bone/JEAN boyfriend jeans. Multiple pocket styles bring a utilitarian edge to cropped boyfriend jeans.